Our staff favorite for DIY standing desk bases, the Vigor combines quality, strength, reliability and versatility with ease of assembly and an industry-leading warranty to make it one of the best options available for building your own custom sit-stand desk or table. 1.7 inches-per-second up to 180 lbs, with some speed loss at higher loads up to 490 lbs. We lab tested reliable lift up to 490 lbs. The strongest base made for DIY applications, bar none. Also one of the most stable, quietest and fastest. Comes partially pre-assembled. Exceptional warranty matches its reliability. One of the few to offer 3-legged (L desk) option and 24" vs 30" feet, as well as "C-leg" (desk) versus "T-leg" (table) configurations. 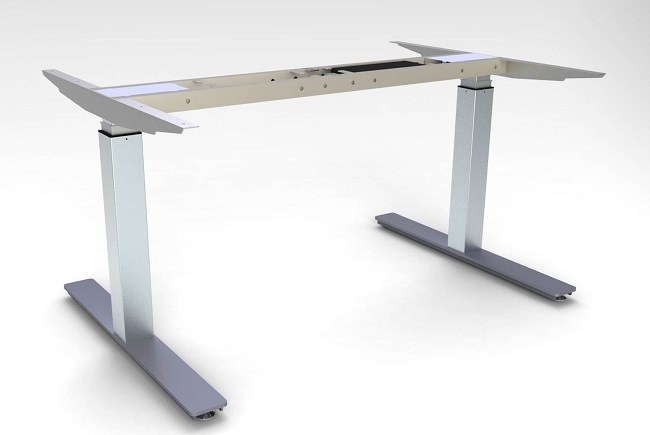 Exceptionally wide max frame setting ideal for large desks, conference tables, and sit-stand-walk treadmill desk configurations. Color options limited to black and silver. No Bluetooth in the hand controller, so no smartphone apps. Very heavy (though this adds to stability, so we actually like it). A little pricier than other bases but for the extra money you do get piece of mind that your desk will work reliability for many years longer than some commodity Chinese-made standing desk. Our staff experts prefer the Vigor over any other DIY standing desk frame for its strength, reliability, and ease of assembly. While not made-in-America it's high-precision Taiwanese-made linear actuators rival anything domestic, and it is TAA-compliant for government purchases. Popular both with the DIY custom desk maker as well as corporate bulk buyers, the Vigor is the strongest and most versatile horse in the stable. The aptly named Vigor is the strongest-lifting standing desk frame made for DIY custom applications, and also one of the quietest, most stable, and fastest-moving standing desk bases overall. As such it is the frame of choice for the DIY builder who wants to be able to use a heavy top, like a thick hardwood or even stone, on their own customized sit-stand desk or conference table. The iMovR Vigor is, rather uniquely, partially factory pre-assembled, saving you significant time and effort in putting together a totally custom standing desk. It’s one of the only bases for DIY that offers both two-leg and three-leg versions, the latter being ideal for making L desks. And it’s one of the few that’s available with either 24″ or 30″ feet. We can attest to the fact that building a DIY standing desk using the Vigor is a much faster and less frustrating process than you’ll find with any other option in the market (and we’ve lab-tested most all of them in our comprehensive round-up of the Best DIY Standing Desk Frames). All you need do is set your desktop upside-down on the floor, rest the Vigor base on top of it, stretch the legs apart and position them exactly where you want them, and then tighten the crossbar set screws. Then, flip each leg up and insert the top support arms which also lock the legs in place once you insert two just two bolts into each motor housing. The Vigor’s frame is well self-contained, including cable management guides and vibration dampeners. With your pilot holes drilled using the screw holes in the frame as your template, you’re ready to screw the base down to the top using the wood screws provided, attach the feet to the legs using the machine bolts provided, attach the digital hand controller using the smaller wood screws provided, and connect up the cables. Even the power supply/controller unit is already attached to the frame. You can check out the detailed instructions here for the 2-leg desk and 3-leg L-table Vigor assembly process. With this ease-of-assembly the Vigor has also become a popular option for corporate buyers that are looking to match a truly customized desktop (sometimes even branded with their own company logo, or laminated in company colors) with a base that is sure to be trouble-free. The Vigor changes height at a blazing 1.7 inches per second travel speed (the demon in the pack on lifting speed) with weights of up to 360 lbs. On our lab tests we were actually able to lift up to 490 lbs—and that’s just with two legs—when most competing standing desk bases can’t even make it to 360 lbs without shutting down for circuit overload or overheating motors. At higher weights, it will slow down a bit from its 1.7 ips top speed, and get ever so slightly noisier than its whisper-quiet 42 dB noise signature, though it’ll still be quieter than a Jiecang base lifting much lighter weights. While these bases are cantilevered in their most common configuration—with the “C-leg” structure that you’d want for a standing desk—the T-leg version of the Vigor is what iMovR uses in its line of Synapse sit-stand conference tables, accommodating up to 14 people without needing to double the cost for a four-legged base, as you would with Jiecang-made bases such as those sold by Jarvis, UpLift and others. With its precision manufacturing quality and smooth performance the Vigor rivals American-made bases like iMovR’s own Reliant. While made in Asia, its Taiwanese linear actuator technology heritage shows—this is no commodity Chinese base. The lifting columns and electronics are made by Taiwan’s TiMotion, and borrows from their deep experience in making linear actuators for heavy medical equipment. The Vigor’s exceptionally strong and heavy feet lower its center of gravity for outstanding stability. Among the Vigor’s high-tech features is anti-collision protection, which makes the desk stop rising or descending if the desk strikes an object like a chair arm or door knob. 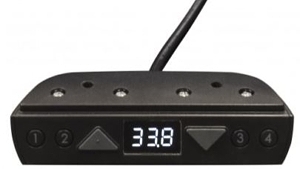 Like most electric standup desk bases these days the Vigor features a fully-digital hand controller with four programmable height favorites. The four height presets make it ideal for a shared workstation so two people can program their individual sitting and standing heights. The height of the Vigor frame adjusts from 24″ all the way up 50″ (not including tabletop) and also features extraordinary range of width adjustment. While other adjustable-width bases can typically have their legs set up to only 55″ apart, the Vigor base can expand out to an astounding 75″ spread. This makes it ideal for really large desks and tables, and especially well suite for sit-stand-walk treadmill desk configurations where you can have a full-sizes office chair sit aside an office treadmill with plenty of room to spare. Height can be further boosted by another 2.5″ by adding iMovR’s optional caster wheel set. The Vigor is a heavy-duty electric base that comes with an industry-leading lifetime warranty on the frame and ten-year warranty on all other components, and is supported by iMovR right here in the USA. This is the go-to base for heavy lifting applications, and with its long 26″ lifting stroke, 50″ top-end height range, and an adjustable width up to 75″, it also makes a superb choice for any treadmill desk application. Besides being the strongest base available to DIY desk builders it’s also much easier to put together than any other kitted base we’ve ever tested. For more details including technical specifications and options see the Vigor on the iMovR website. To compare to other DIY bases check out our comprehensive round-up of the Best Electric Standing Desk Frames for DIY. To stay abreast of all the latest developments in office fitness please sign up for a free newsletter.